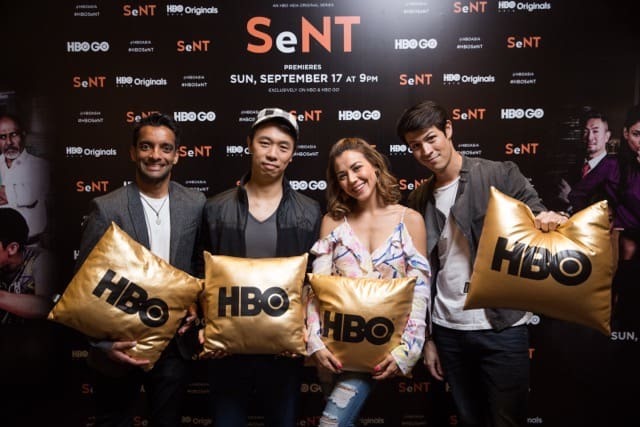 SINGAPORE, August 24, 2017 – The ensemble cast of HBO Asia’s first comedy drama series, SENT (#HBOSeNT), were in Singapore today to promote the series which premieres exclusively on HBO (StarHub TV Ch 601) on Sunday, 17 September with two back-to-back episodes from 9pm. Two new episodes will premiere at the same time every subsequent Sunday.SENT will also be streaming on HBO on StarHub Go and HBO On Demand (StarHub TV Ch 602). Director and co-producer of the eight-episode half-hour series, Alaric Tay (also known as Alaric), as well as cast from the series – Haresh Tilani, Alan Wong, and Carla Dunareanu were in attendance. The first episode of SENT, about the life of an unremarkable and meek office worker whose life is turned upside down after his draft emails to anyone who aggravates him get accidentally sent, will also be available online on HBO Asia’s website (http://hboasia.com) across 22 territories in Asia from 18 to 24 September. Non-subscribers and subscribers alike will be able to watch the episode online with local language subtitles (where available). In theme with the series, HBO Asia has also developed a microsite (http://hboasia.com/sent/), where viewers can use the Inappropriate Email Generator to craft appropriately inappropriate angry, lustful or jealous emails directed at bosses, colleagues or in-laws with different levels of intensities. Viewers can also be in control of their destinies and stand a chance to win one of three Playstation 4 Pros by submitting their most embarrassing story through the microsite – contest ends on 8 September, 2017 and winners will be announced by 29 September, 2017, on HBO Asia’s facebook page. Set in Singapore, SENT is the first HBO Asia Original production that has been filmed entirely on location. Singaporean comedian Alaric directed and co-produced the series. Best known by audiences for his funnyman antics on The Noose (eight seasons, 2007 to 2015) and HBO Asia’s 2013 drama series, Serangoon Road, SENT marks Alaric’s first time directing a TV series as well as his first TV series to be picked up by a regional broadcaster. Developed by HBO Asia and produced by local production house Very Tay, SENT features an ensemble cast of actors who are based in Singapore, Malaysia, Thailand, India and Hong Kong. Haresh Tilani (Ministry of Funny) stars as Jay Bunani, an unremarkable and meek financial compliance officer; Alan Wong (Tanglin) is Max Wong, Jay’s old college friend; Carla Dunareanu (The Kitchen Musical) is Zoey Wong, Max’s wife; Rosalind (Roz) Pho (Light Years) is Charley Siew, a young journalist at a local sensationalist online portal trying to be a real reporter; and Adrian Pang (The Blue Mansion) is Zacheus Lee, a shady businessman. SENT also stars David Asavanond (HBO Asia’s Halfworlds Season 2) as a charismatic self-help guru, Dhanya Nambiar (Rojak) as Jay’s older sister, Indi Nadarajah (Setem) as Jay’s traditional father, Anuradha Chandan (Kapoor & Sons) as Jay’s overbearing mother, Laanya Asogan (On the Rocks) as Jay’s image conscious fiancé, Emil Marwa (East is East) as Jay’s cousin, Mike Leeder (The Mummy: Tomb of the Dragon Emperor) as Zacheus’ right-hand man, Nikki Muller (High Class) as Charley’s boss and owner of the sensationalist online portal SKWASH, Stephanie Carrington (The Pupil) as Jay’s attractive work colleague and Crispian Chan (Apprentice) as Jay’s slightly eccentric boss. After the e-mails are sent out, Jay is fired from his job and his girlfriend dumps him. A journalist called Charley publishes his story online. With nowhere else to go, Jay looks up his old friend Max just as his story goes viral on the internet. SENT is produced in partnership with the Info-communications Media Development Authority (IMDA) as part of a two-year collaboration to develop the drama production capabilities of Singapore’s media industry and talent. Under this partnership, HBO Asia will work with local talent and companies, and train them to develop and produce compelling content for international audiences. SENT is HBO Asia’s third Original production this year following the second season of HALFWORLDS, the dark action fantasy drama series set in Bangkok which premiered in January and THE TEENAGE PSYCHIC, HBO Asia’s first original Chinese series set in Taiwan that premiered with breakthrough ratings in April. To date, HBO Asia has produced nine Asian Originals with more slated to premiere in the coming years. Being the first network in Asia to produce original content for the region since 2012, HBO Asia is committed to expand its repertoire for Asian audiences. 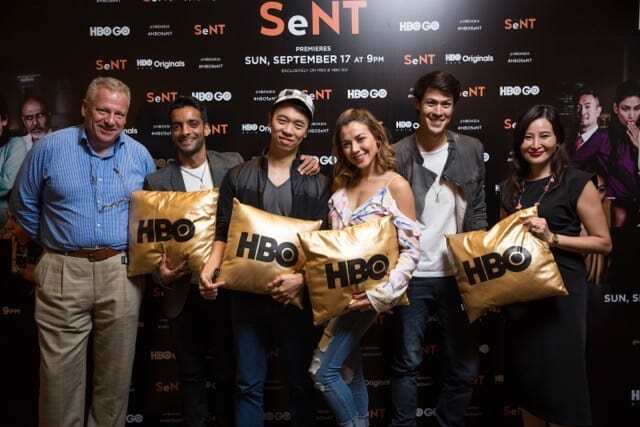 HBO Asia’s first original comedy drama series, SENT, premieres exclusively on HBO (StarHub TV Ch 601) with two episodes back-to-back on Sunday, 17 September from 9pm. Two new episodes from the eight-episode half-hour series will premiere every Sunday from 9pm. The series will also be streaming on HBO on StarHub Go and HBO On Demand(StarHub TV Ch 602). Set in Singapore, SENT, tells the story of Jay Bunani (played by Haresh Tilani), an unremarkable and meek financial compliance officer whose only way of coping with the stresses of life is to draft searing and eye-wateringly honest emails to anyone who aggravates him. This backfires one fateful day and his drafts folder full of hundreds of these “hot letters” are accidentally sent out, turning Jay into an Internet sensation overnight – and not the good kind. While also juggling the pressures of a failed engagement and keeping everything a secret from his parents, Jay has no choice but to turn to an old college friend, Max Wong (played by Alan Wong) for help, the only person who sees Jay’s predicament as an opportunity for Jay to dream a little bigger. Set in the world of memes, GIFs and hashtags, Jay’s journey of self-discovery is further set in motion when an unexpected job opportunity with the country’s leading restauranteur and slightly-shady business man, Zacheus Lee (played by Adrian Pang), leads him down an unexpected road to finally turning his life around.